Paradox launches multi-part developer diary ahead of next update. Off the back of its recent Plantoids DLC release, Paradox has launched a series of developer diaries which outline where Stellaris is headed next. Via its Heinlein 1.3 patch—set to arrive in October—the Swedish 4x-meets-grand strategy specialists will focus on “addressing community feedback” as it installs a “large number of interface and quality of life improvements” moving forward. Rally Points will provide a more efficient way to manage newly built ships. Ultimately, this means you’ll be able to mark any star and war fleet you own as a rally point—meaning that when warships are first constructed, they’ll seek out the nearest rally point instead of hanging around their planet of birth, and will in turn automatically merge with the nearest fleet. 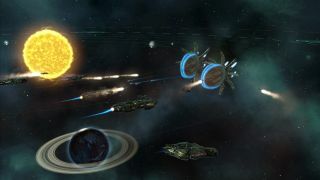 Stellaris’ Heinlein patch 1.3 is due at some point in October, with more of this developer diary series expected in the coming weeks. In other Stellaris news, a hotfix was issued earlier today aimed at Xeno Integration and special project research. Full details on that can be found this way.